Designed in collaboration with Bryton, this powerful yet price savvy unit features a 2.6" screen, a massive 33 hour battery life, ANT+ and Bluetooth connectivity, plus turn by turn breadcrumb navigation. Designed to meet a variety of training needs for cyclists, there's an option to plan and perform workouts in the 'Giant lab'. The 'testing' option allows you to record your max heart rate, lactate threshold heart rate, FTP and MAP (max aerobic power). 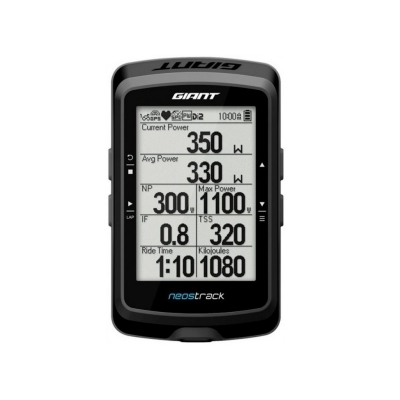 The step by step instructions on screen make it easy to follow, with the results auto imported into your account to improve your training zones and ride feedback. All of your data is stored in the NeosTrack app via Bluetooth or Wi-Fi upload, available on Android or iTunes. From here, you can easily set up auto upload functions to popular training apps such as Strava or TrainingPeaks. From the NeosTrack app, you can plan routes and upload back to the head unit with ease. Buy your Giant Neos Track GPS Computer from LivSpares.com.